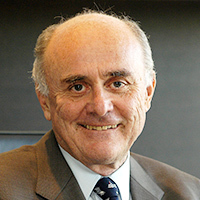 Professor Allan Fels AO graduated in economics (first class honours) and law from the University of Western Australia in 1965. He has a PhD in Economics from Duke University and was a research fellow in the Department of Applied Economics at the University of Cambridge from 1986-1972, where he wrote The British Prices and Incomes Board (Cambridge University Press, 1972). On his return to Australia Professor Fels joined the Economics Department of Monash University as a Senior Lecturer, before becoming Professor of Administration and Director of the Graduate School of Management from 1984 until 1991. The career of Professor Fels in Australia falls into two parts. He was generally regarded as the nation's leading regulator, serving as inaugural Chair of the Australian Competition and Consumer Commission (and its predecessor bodies) from 1989 until 2003. The Australian Competition and Consumer Commission is the country's regulator of competition law and consumer law; it also regulates public utilities in the telecommunications and energy industries (in a similar manner to industry-specific bodies such as Ofcom in the UK and FCC in the US). He has had numerous other regulatory roles (for example, in insurance, agriculture, telecommunications and aviation). Professor Fels was regarded throughout Australia as a very successful and effective regulator. He was and remains a household name and was ranked by The Australian Financial Review as Australia's third most powerful figure in 2002; he is the subject of the biography Allan Fels, A Portrait of Power, by Fred Brenchley (John Wiley Publishers, 2003). Professor Fels remains a leading figure globally in competition policy. He co-chaired the OECD Trade and Competition Committee from 1996 to 2003 and continues regularly to be a keynote speaker at major global competition events including the world's two peak events, the International Competition Network Annual Conference and the OECD Global Competition Forum. He was a participant in the 15-year process of drafting the Chinese Antimonopoly Law 2008 and currently advises the Chinese government on the law's implementation. Academically, he is co-director of the Competition Research Centre at the Chinese Academy of Science, a prestigious position, and an international adviser to the Chinese Academy of Social Science. The second part of Professor Fels' career has been academic. He was appointed Foundation Dean of the Australia and New Zealand School of Government and served in that position from 2003 until 2012. The predominant activity of the School has been the provision of management development programs to senior public servants in the two countries. There is also a substantial research program and other professional and outreach activities. A major activity of Professor Fels in recent years has been the provision of programs for top public sector leaders in China and India. The China Advanced Leadership Program – conceived, negotiated and directed by Professor Fels – is undertaken in partnership with the Organization Department of the Community Party of China, the Department in charge of all important personnel decisions in China and generally regarded as the most powerful part of the Communist Party of China (see for example Richard McGregor's The Party, Harper Collins, 2011). Professor Fels also plays other major roles in Australia. He is the former Chair of the National Mental Health Commission and takes part in many government committees and major inquiries at both national and state levels in many fields. For example, he has chaired or co-chaired major inquiries into executive pay, government integrity, parliamentary entitlements, the Access Privacy card (a kind of national identity card), community organizations, the taxi industry, insurance company pricing, and health evaluation programs. He chairs the Haven Foundation, which provides accommodation to mentally ill persons. He also chairs the Governance Board of Visy Australasia, Australia's largest private sector firm. Professor Fels was made a member of the Order of Australia in 2002 (the equivalent of a knighthood). He was nominated (unsuccessfully) for Secretary General of the OECD in 2005 by Australia.